The new Los Angeles LGBT Center campus includes drop-in centers for both youth and seniors as well as 100 beds for homeless youth. 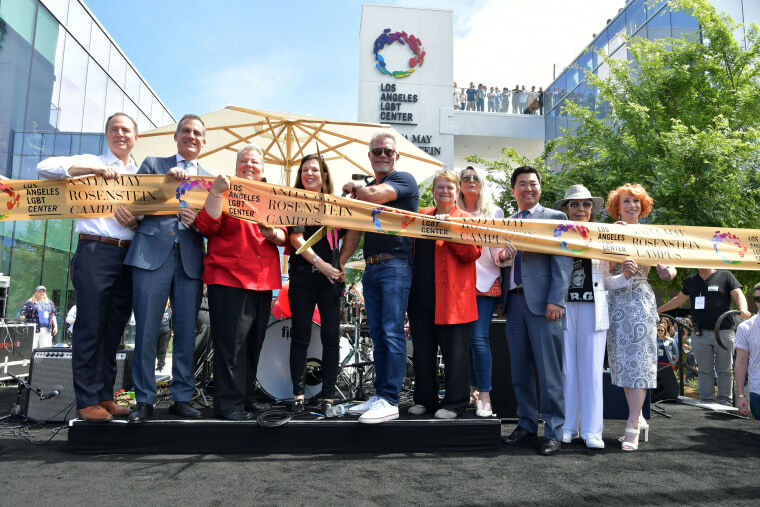 “Grace and Frankie” star Lily Tomlin joined comedian Kathy Griffin at Sunday’s block party celebration to help ring in the Los Angeles LGBT Center’s new campus. Los Angeles LGBT Center CEO Lorri L. Jean, County Supervisor Sheila Kuehl, Rep. Adam Schiff, Councilman David Ryu and Mayor Eric Garcetti all delivered remarks on stage to thunderous applause. Griffin shared in Garcetti’s sentiment, praising the LGBTQ community for pursuing change in the midst of a discriminatory presidential administration. Following the ribbon-cutting ceremony, a block party celebration included campus tours, a number of live performances and a beer garden. Music artists such as VINCINT and Betty Who took to the stage with acoustic renditions of some of their most popular songs alongside the Trans Chorus of Los Angeles and “Transparent” star Alexandra Billings. Supporting the new campus are more than 350 capital campaign donors, including 15 seven-figure donations led by Anita May Rosenstein’s gift of $8 million through the Anita May Rosenstein Foundation, Wilbur D. May Foundation and the Anita and Arnold Rosenstein Family Foundation.